Why do women find work-life balance so hard? Why is having it all such an illusive quest? Why haven't women achieved equality yet in the leadership ranks? Authors Jodi Ecker Detjen, Michelle A. 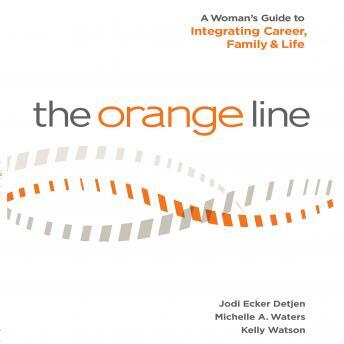 Waters, and Kelly Watson probe these questions and more in this highly anticipated new book: The Orange Line- A Woman's Guide to Integrating Career Family & Life. Through interviews with 118 college-educated women, they document the varied career stories and day-to-day anecdotes in the ongoing work-life struggle. They also uncover a revolutionary new line of thinking: Women are holding themselves back with outdated ideals and rigid rules for how to act. Naming this limiting belief system The Feminine Filter, the authors call on women to reframe their assumptions, shed their guilt, and pursue their vocation with passion. The authors provide tools to help women remove this Filter so they can see more clearly to a new career path that includes work, family, and themselves. It is the most radical call to arms for women in decades, but instead of asking governments and organizations to change, the authors inspire women to look inward to claim their power.